Look at this guy. This is not a man who should release solo records. Just look at him. Okay, perhaps I’m being a bit unfair here. Would I have written that if Albert Hammond’s Yours to Keep were any good? Well, yeah, I probably would, but I’d then go on to write about all of the massive obstacles that this dude must have overcome before getting a solo record out there. Fortunately for me, but unfortunately for my ears, Yours to Keep is boring, boring, boring. The man can play guitar; I’m not claiming anything to the contrary. 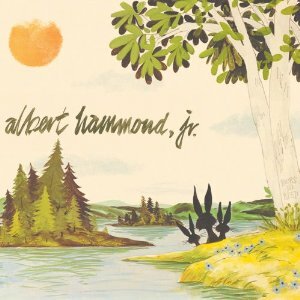 After four records as The Stroke’s main riff-generator, I definitely respect Hammond and his musical abilities. However, when it comes to any other aspect of an indie rock record (i.e. songwriting, pacing, likability), he falls flat on his face. And that hair. Unfortunately, Hammond doesn’t even stick with the rock-tastic guitar pieces that we have all come to expect from him when he is with The Strokes. With some acoustic numbers, and a few inexplicable and flagrant rip-offs of Fountains of Wayne, Yours to Keep has left me more confused than anything else. I must admit, it is very likely that I’d be annoyed if Hammond created a record that sounded exactly like a Strokes effort, so y’all probably shouldn’t listen to me. You know that by now, though. But once again, I ask you to look at that dude. Tell me you feel comfortable listening to something put out there by him. I’d rather listen to Ken. Thank you. Truly Choptastic. I had no idea the music and hair were genetic. As for the album, I think Earchik got it right. His solo effort is too much like his dad, and not enough like his band. I clicked every link. Vaguely obsessive, Mr. Ear, but vintage stuff (LMFAO). Also, thanks for the info on Ken. You’re always teachin’ me something.